Outside the Leon Senior Center on East 152nd Street and Concord Avenue in the Melrose section of the South Bronx where Mayor Bill de Blasio went Monday to quell fears during the city's largest and deadliest outbreak of Legionnaires' disease. 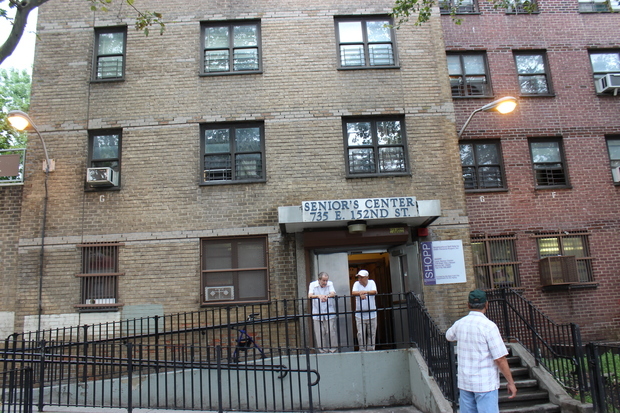 MELROSE — Amado Caballeo listened closely as Mayor Bill de Blasio warned regulars at the Leon Senior Center on East 152nd Street to seek medical treatment if they had flu-like symptoms that could signal Legionnaires' disease. "This is a form of pneumonia and we can treat it with antibiotics," de Blasio said during his Tuesday visit, an attempt to quell fears during the city's largest and deadliest outbreak of Legionnaires' disease. So far, the outbreak has been contained to the South Bronx, where it has killed 12 people and sickened a total of 119. Twenty buildings in and around the cluster zone have tested positive for legionella, the bacteria that causes the disease. Of the people who have died in the outbreak, all but one was over 40 and all had underlying health issues. 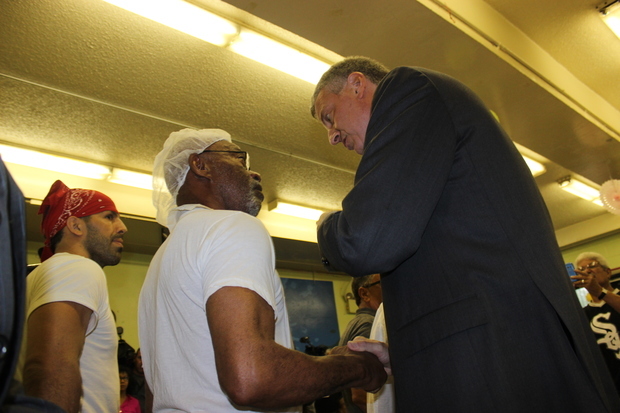 Mayor Bill de Blasio paid a visit to the Leon Senior Center on East 152nd Street and Concord Avenue in Melrose to talk to senior citizens about the city's largest and deadliest ever outbreak of Legionnaires' disease. "Everything he said was good," said Caballeo, 77, a retired factory worker. "I listened because no one wants to be sick." The real problem is that the neighborhood he has called home for 45 years is "on the bottom," Caballeo said, as he left the senior center with his cane on one side and his home health aide on the other. "This area is abandoned," he added. "It's real below." City officials have acknowledged the Legionnaires' outbreak couldn't have hit a worse neighborhood in New York City. People with underlying illness such as asthma and compromised immune systems, an effect of HIV and AIDS, are more susceptible to legionella. The South Bronx neighborhoods affected by the outbreak have one of the highest asthma rates in the country, as well as the highest new HIV infection rate in the city, studies show. A 2013 study from state health officials found that The Bronx has the highest number of annual asthma deaths in the state, at approximately 58, and the highest age-adjusted asthma death rate, at 43.5 deaths per million residents. Neighborhoods such as Mott Haven and Hunts Point are referred to as "asthma alley." The South Bronx also counts one out of four new HIV infections in the city and more than one out of three AIDS death, according to the Department of Health. Legionnaires' disease in the city grew 230 percent from 2002 to 2009, according to a study last year by the health department. The pattern of growth also "followed a socioeconomic gradient, with highest incidence occurring in the highest poverty areas," the study found. In high-poverty neighborhoods there are three cases of legionella per 100,000 people, versus only 1.2 per 100,000 people in low-poverty neighborhoods. Additionally, South Bronx is the poorest congressional district in the country. Diabetes is also another risk factor for being affected by legionella, the study found. The South Bronx has a diabetes rate of 16 percent, double the national average. The study concluded that the "findings suggest systematic differences in the risk for acquiring Legionella infection based on neighborhood-poverty level" and that "these socioeconomic disparities in disease should be of concern to public health policy makers." De Blasio insists there is great concern. "I think the entire mission of this administration is to address the reality of the South Bronx and other communities that haven’t had a fair shake for decades," de Blasio said Wednesday. "One of the poorest areas in the nation, the poorest congressional district in the nation — this is a community that’s suffered for many decades. Part of our sense of mission is we have to address the inequalities of the South Bronx in health care and in many, many other areas as well," he added. Health and Hospitals Corporation head Dr. Ram Raju said his agency was taking steps to address long-standing health issues such as asthma and diabetes in poor communities across the city. "South Bronx gets a special treatment, because, as [the] mayor pointed out, there is a large health care disparity in [the] South Bronx," said Raju, who didn't offer specifics. The administration's response has come under criticism from the likes of Comptroller Scott Stringer, who said the city "didn't scramble the planes fast enough" Wednesday on a local radio show. The mayor called that assertion "absolutely inaccurate." Bronx Borough President Ruben Diaz Jr. called for the state to step in and also for legislation to regulate cooling towers. Before the city and the state agreed to pass joint legislation governing the inspection and cleaning of cooling towers, Gov. Andrew Cuomo said the state was "taking matters into our own hands" and invited in the Centers for Disease Control to The Bronx for a situation that appeared "critical," he added. "It is almost like a bad science-fiction movie," Cuomo said during an interview Friday on NY1, in describing the outbreak. America Peguaro, 41, a home health aide, said she wasn't pleased with the city's response to the outbreak. "They've been moving kind of slow to handle this," she said, while passing by the Leon Senior Center on her way to a grocery store with her son minutes after the mayor departed. "They should've taken action to help us faster and had less talk," she added. Bronx Assemblyman Michael Blake represents areas where the outbreak occurred. He said he wasn't surprised that Legionnaires' had hit the community hard because of existing issues. "It's a decades-old problem," Blake said outside Lincoln Hospital. As the outbreak spread, Blake said there was both a sense of anxiety and weariness among his constituents. "You have a multitude of issues happening at once in this community. Poverty and community-challenged public health being two of the biggest," he said. "This, unfortunately, is not new." But Blake said he was hopeful the city and state would "use this outbreak to fix the broader issues of basic health and economic opportunity." Caballeo isn't sure that's going to happen. "They don't fix anything around here," he said.